It's official. I am now a proud owner of the infamous Blogger Bubble Necklace. I know, I know, it's old news. Everyone has it in 500 colors and here I am with just my one simple black beauty. I am sure it won't be long until I add a few more to my collection. I really do love it and want to send a HUGE thank you to JewelIQ for sending it over to me. If you haven't checked out this online jewelery shop, you are missing out. Everything is $25 or less and that includes shipping. So. Much. Cute. Stuff. Okay, now the bow part. I adore this dress. It's one of my faves because of it's simplicity and versatility, but I didn't like that it came with a matching bow belt. It needed something to help separate the top from the bottom. So I took a belt one from another dress and tied a bow on the side. And can we talk about how much I have worn these shoes? They have been my summer go-to. I definitely got my $20 wear out of them and then some. I love how I can lace them up and make a bow in the front (here), one in the back (here) or on the side like I did in the pictures above. Plus, they are super slimming for the ankles! Thanks for all the sweet and heartfelt comments yesterday. I was overwhelmed and truly touched. I am so blessed to have each and every one of you in my life. I am so grateful to share my thoughts and experiences with you and that you take time out of your busy day to read and comment. Cheers to girly things...like bubbles and bows. 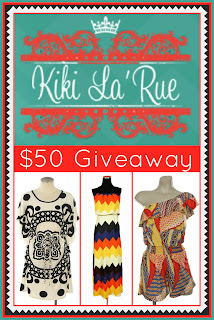 Last chance to enter the Kiki La'Rue giveaway going on right now!! You always look so gorgeous! That color looks so great on you. That necklace is looking mighty cute on you! Yay! Congrats on the bubble necklace...love the classic black version! Beautiful pairing of lime green with black accessories! Love the necklace! It's becoming a classic! The color of that dress looks great on you! You look smokin! and that bow is perfect!! The color of that dress....love it! Ohhhhhh yeah. I LOVE the black with it! I just ordered that dang necklace in turquoise, but NOW I want a black one too!!!! I love your necklace of course!! I finally ordered one off eBay and now I want more colors! This dress is so pretty on you too, love the color! Please become my personal stylist! I will even pay you ;) ADORBS!!!!! loved when you posted a glimpse of this outfit on instagram - I love it!! You look so cute! I love the bold color paired with black accessories! your dress is gorgeous, i love it and it suits you. Love the dress, esp the color! great look on you! Gorgeous Shanna! This color combo is awesome! Seriously love the neon with black! Hope your having a great week girl !!! You look so pretty and classy! I'm seeing a lot of cute ON stuff from bloggers. Whenever I go to our store there is never cute stuff. I think they send all the cute stuff to other stores!! love neon on you you pull it off SOO well!!!! You're such a hottie! Those black pieces really pop paired with that dress! It looks great. So pretty! Definitely checking out this JewelQ, thanks for the tip! The neon dress with all those black accents, is just perfect! Ok so we are twinsies. Today is all about saying thanks on the blogs today. Oh and that skittles necklace well you are officially a blogger. Sister here is so proud. I LOVE the whole outfit - and I've been dying to get my hands on the famous blogger necklace lol I've been wanting a black one! And PS - we have the same ON shoes! I wear mine all the time, too and have been experimenting with tying them different ways! i've decided that i think you're too adorable in your outfits to have BOS. LOVE everything going on here! I fell in love with this dress in the store but they didn't have my size!!! Ahhh....so glad you have it and are totally rocking it!! You apparently need to take me with you when you go shopping at ON because this outfit is amazing! The color is just phenomenal. And those shoes...those shoes...I love them. And that bracelet...oh well I might as well just throw everything in there b/c I love it all!! Love everything about this outfit, but especially love the person wearing it! Beautiful as always!!! Your comment about the necklace made me laugh because as soon as I saw your outfit I thought "man, I'm the ONLY one who hasn't bought one of them puppies!" Love the whole outfit! Love that color on you girlfriend! I love this whole outfit! very cute :) and now I think I'm the only one without one of these necklaces! You have to own the "blogger" necklace! :) It looks great on you! I LOVE this dress! I NEED it in my wardrobe!! You are too cute and I love how you are so open on your blog. Very inspiring. In love with the color of this dress! What a cute outfit. I love the colour of the dress and the black accessories just make the outfit. THIS IS MY FAVORITE OUTFIT OF YOURS SO FAR.. BRIGHT AND BEAUTIFUL! i love the color of that dress and it looks amazing on you!! Stop by and link up to Like Me on Facebook. You can link up your fan page and twitter accounts. Over 100 blogs so far. Love to have you! Fabulous outfit! I love that you added contrast with the belt. I love the bubble necklace :) I think you are going to wear it all of the time, I just love mine! Hope you had a great day! I ordered my necklace so long ago.. still waiting!! Getting impatient.You look so cute!! LOVE the dress - especially in that bright color! Keeping the necklace in the "simple" black was perfect. You look great! This outfit would be PERFECT for the NEON link-up I'm hosting! It's my first time hosting a link-up, and I hope you stop by! girl, you look amazing!!! such a fun color dress! Gorgeous color on you darling! Love it with your hair. I love the color of this dress...and with the black accessories...POW! I am also going to check out JewelIQ...thanks! Love this outfit, especially the bracelet! I'm definitely going to buy something from JewelIQ now! I love how affordable everything is. The bubble necklace never gets old to me! Such a cute blog! I am your newest follower! I LOVE, love, love this dress!! I also love that you paired it with black and not some other crazy color :) (Not that the green is crazy, but well hopefully you know what I mean!) :) Love the jewelry, shoes & belt too!!! I just got one of the coveted bubble necklaces last week (from Ebay because I'm cheap - $14!) and love mine! I ordered 3 more :) Funny, everyone in blog world seems to have them but I haven't really seen anyone in "real life" with them! YESSS! welcome to the blogger bubble necklace world!! i LOVE the neon with the black necklace!!! so cute for this time of year! That color looks so good on you! I definitely agree that the matching belt would have been too much. It looks perfect now! Great dress, love the color!